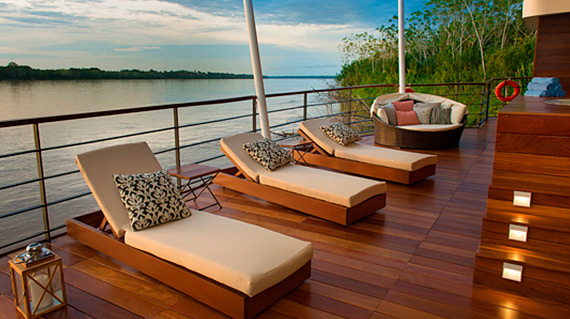 M/V Zafiro is a Luxury cruise down the Amazon by Voyagers. Slide trough the mysteries of the jungle and the roaming Amazon aboard the stylish Zafiro. All feature en-suite sitting areas and Panoramic view floor-to-ceiling windows with separate balcony overlooking the Amazon River. 4 interconnected suites ideally for families. 1 suite has disabled facilities. 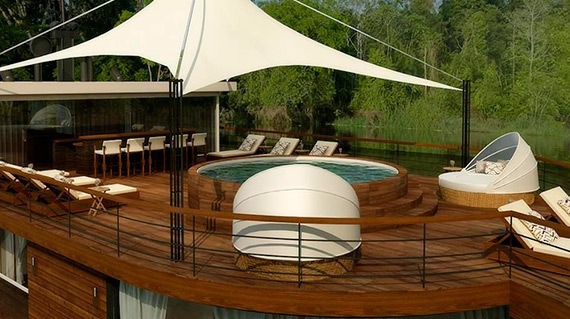 Let’s cruise the Amazon Jungle on board the Zafiro! All about the Zafiro Amazon River Cruise. All feature in suite sitting areas and Panoramic view floor to ceiling windows with separate balcony overlooking the Amazon River. 4 interconnected suites ideally for families. 1 suite has disabled facilities. Master suites (4): 23 m2 / 247.57 ft2 with 90-degree front-facing windows, all are air conditioned with en-suite bathroom and living room. A crew of 20 including Cruise Director will meet all of your onboard needs, and two naturalist bilingual guides (english- spanish) are there to introduce you the area’s natural wonders. Arrival from Lima (1 hour 25 minute trip to the capital of the Peruvian Amazon). Your guides will be expecting your arrival at the airport, and transfer all together in our comfortable private vehicle over paved road to the main wharf to board the Zafiro, your home for the next seven nights. Embarkation and check in aboard the Zafiro. Our qualified staff will introduce you to your stylish suite, specially equipped with all the amenities for the experienced traveler as yourself. 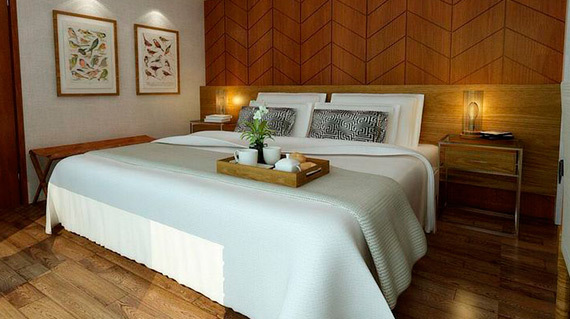 Comfortable beds, pure cotton sheets, pillows, cotton bathrobes, air conditioning, private bathroom with Spanish style hot water showers, and a private balcony on each suite in the upper deck. During the next seven days the Zafiro will sail the Amazon, Ucayali and Maranon Rivers and their amazing tributaries bountiful in wildlife. While the Zafiro begins its primary navigation, enjoy the most fantastic panoramic views from the gracefully interior lounge located on the third deck. Our bartender will be waiting to serve you an exotic cocktail made with regional fruits and pisco, the national brandy liquor of Peru. Before lunch, your naturalist guide will give you an overview of your journey’s schedule, activities, route, highlights, wildlife and vegetation, geographical and historical background, and other useful details. Moreover, should you have any doubts or questions, our guides are always at your disposal. Our vessels have an open policy, so you are welcome to learn about the navigation systems and spend time with the driving captain at any time. Welcome Dinner at 8:00 pm. Salute your journey with our fine South American wine that accompanies the Amazonia-influenced cuisine of Jungle Experiences (our menu offers several choices, including a vegetarian option – please let us know any other specific dietary requirements in advance). After the welcome dinner we invite you to the third deck were you can enjoy starwatching while we cruise into the depths of the Amazon Rainforest, or else relax with live music performed by our band on board enjoying a varied repertoire of Amazon, national and international music. Yanayacu of Yacapana Exploration. Board our comfortable excursion skiffs for your first adventure. Life jackets, ponchos, rubber boots, and plenty of cold drinking water are always available for you on board the skiffs. Early birdwatching into the native kukama reserve (yanayacu of yucapana). This reserve has about 17 black waters lakes, bountiful in wildlife and home of Ayacucho and San Juan native communities. This morning we will observe monkeys, parrots, macaws and learn more about nature. Breakfast. Our lavish daily buffet breakfast offers a wide selection of traditional dishes, Peruvian specialties, homemade baked goods and fresh-squeezed juices. Amazon birth place expedition. After breakfast, the Zafiro skirts the edges of Pacaya-Samiria Reserve, a flooded forest covering five million acres at the headwaters of the Amazon basin. Board our comfortable excursion skiffs for your expedition on the confluence where the Maranon and Ucayali Rivers join together forming the mighty Amazon River. Nature here appears especially dramatic: birdsong accompanies your morning excursion as you glide past river banks inhabited by large-billed terns, laughing falcons, gray tanagers, and sandpipers, five kinds of parakeets, the exotic short-tailed parrot, and countless other colorful birds. We will explore the first river into the Pacaya and Samiria National Reserve named: piranha creek, in searching of wildlife; this area is known as the parrot-parakeet paradise. Return to the Zafiro at 11:30 am followed by lunch, Peruvian inspired midday flares in our air-conditioning dining room, while we start to sail up the Maranon River. Amazonian Philosophy Lecture. One of our naturalist guides will introduce you about the idiosyncrasy, beliefs and deep thoughts of the Amazonian people, such as the spirituality that is everywhere and not only on human beings. Late Afternoon excursions to Nauta Creek within Pacaya-Samiria Reserve which is known as the mirrored forest, which makes perfect sense as you gaze upon its glistening black water lagoons. Our naturalist guides use their eagle eyes to help you spot toucans, parrots and macaws overhead and iguanas, sloths and monkeys among the soaring trees. On the way back to the Zafiro, the glorious sunset is reflected in these glistening waters. Return to the Zafiro. Perhaps sip a pisco sour on the observation deck with a live music concert from our local band followed by another Peruvian- inspired dinner. Optional Nocturnal boat ride to enjoy the symphony from the night and constellations, as well as search for caimans, tarantulas, boa constrictors and more. Yanayacu of pucate and Yanayaquillo exploration, followed by delicious breakfast aboard the skiffs. Early in the morning you will start cruising through the Yanayacu and Pucate Rivers, peeking into different creeks and lagoons. This is one of the best preserved and protected zones of the Pacaya Samiria National Reserve. Your guide will use his expert eye to pinpoint all the biodiversity of this region. This is also a popular dolphin feeding spot so we won´t be the only one enjoying our happy meal here. Return to the Zafiro at 11:00 am to enjoy a delicious lunch followed by heartwarming siesta. If you want to interact directly with the waters of the Amazon, go out on one of our paddle boards. You will even have the opportunity to swim in the river along with the famous pink dolphins! 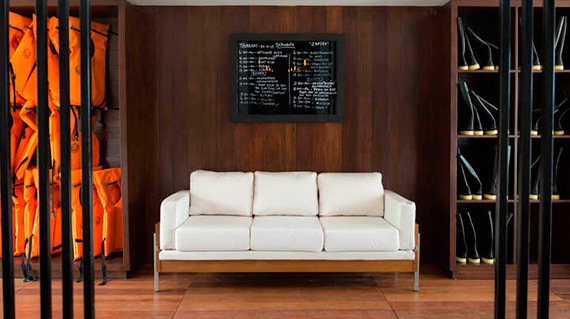 In the afternoon, enjoy a lecture about Geographical orientation in our air-conditioned Indoor Lounge. Learn about hydrography of rivers to explore sustainable species according to the natural resources of the area. Perdida Creek Expedition. On this late afternoon excursion, you are going to have a skiff boat expedition into this beautiful creek, full of colorful birds, such us: Paradise tanager, masked crimson tanager, Wood peckers, awls, scarlet crowned barbet and enjoy the great symphony they create. Return to the Zafiro for Dinner. monkeys, nocturnal birds such as boat billed herons-great potoos and more. Wildlife is always active early in the morning, late afternoon and night, turning out into an amazing experience. Samiria River expedition. After breakfast our skiffs skim the Samiria River and its tributaries, where an abundance of wildlife hides in the deep rainforest, such as blue and yellow macaws, scarlet macaws, toucans, umbrella birds, monkeys, and river others, capybaras and more. Return to the Zafiro at 11:00 am followed by lunch. at this riverside community. Your naturalist guide acts as interpreter so that you may talk with them about their life along the Amazon. Of course, no one has to interpret these kids’ bright smiles and wide eyed curiosity about you. This visit also offers an excellent opportunity to buy easy to pack artisanal handicrafts, from painted coconut bowls to surprisingly chic seed bead jewelry. Tipishca Lake formed over 100 years ago by the Las Piedras River Cutting through the neck of a sharp meander. Lake Tipishca harbors good fish stocks, including piranha and catfish. Bird life on the lake is plentiful, the lake attracts many species which include, blue and yellow macaw, grey-necked wood-rails, putrescent tiger-herons, wattle jacanas, amazon and pygmy kingfishers, green ibis, black –collared hawk, black capped mocking thrush and yellow-rumped caciques. You might also spot hoatzins; red capped cardinals, and ringed kingfishers. Enjoy live music from our local band aboard the Zafiro followed by a splendid dinner. Pampa creek expedition. Before breakfast early birdwatching. We follow its shoreline, sure to surprise the many species of monkeys and birds, including terns, neo-tropic cormorants, egrets, herons, hawks, and our favorite horned screamers. piranhas into Shiriyacu stream, and walk into the jungle to meet a local healer to learn about complementary medicine from the amazon and ancestral traditions that we have been losing. This experience will give us the opportunity to formulate questions to the healer and know a bit more about our former traditions. Lunch at 12:00 am. Share a last meal with fellow passengers who have taken the four-night journey. Myths and legends Lecture. One of our naturalist guides will explain the origin of myths and legends from the animistic point of view. Late Afternoon excursion. We navigate on a small connector canal between the Ucayali and Maranon Rivers, to admire the world’s largest aquatic plant, the giant water lilies, or Victoria Regias. Here, you become one of a very small number of people who have ever seen these plants bloom. When the night falls, you will listen the second movement of the Amazon rainforest symphony, as nocturnal animals send their piercing calls across the canopy tree. As we take the skiffs back to the Zafiro, special spotlight torches help our naturalist guides to locate caimans, owls and capybaras. Return to the Zafiro around 7:30 pm and enjoy a relaxing dinner with your table companions. Tapiche River Exploration. On the way back to the Zafiro we are going to explore into Tapiche River and begin our jungle walk guided by our guides to learn about medicinal plants, search for insects, snakes, birds and more. Here, deep in the primary rainforest, your guides identify for you the fruit trees and medicinal plants that comprise the Amazonia’s natural pharmacy. Return to the Zafiro followed by lunch. Dorado River Exploration and Night Excursion. At 4:00 pm, take a magical journey aboard the skiffs through the “Mirrored Forest” to see towering trees reflected in the black water river, while on the lookout for enchanting parrots, blue-yellow macaws, as well as the great variety of primates and sloths unperturbed by our presence. As we make our way back to the vessel, our guides point out caimans and frogs in the water, and fishing bats overhead. Return to the Zafiro around 7:30 pm followed by a delicious dinner. Expedition to the Yarapa River. We continue exploring the waterways by skiff, to where gray and pink freshwater dolphins swim and play around our boats. The people of the Amazonia believe these very dolphins turn into humans to steal handsome men or pretty women from their villages during celebrations. On this excursion we will observe monkeys such as brown capuchin and saddle backed tamarin monkeys, birds such as fly catchers, trogons, wood peckers and more. Return to the Zafiro at 12:00 pm, and begin sailing down river, toward Iquitos. Followed by lunch and siesta. Cooking class experience in Panguana 2nd Zone. We will have our cooking class in a native home with your naturalist guide as interpreter. We will learn by first-hand about the amazon cuisine and taste our Amazonian culinary art. Return to the Zafiro. Once we are back on board, the ship continues downstream, sailing toward Iquitos through the night. 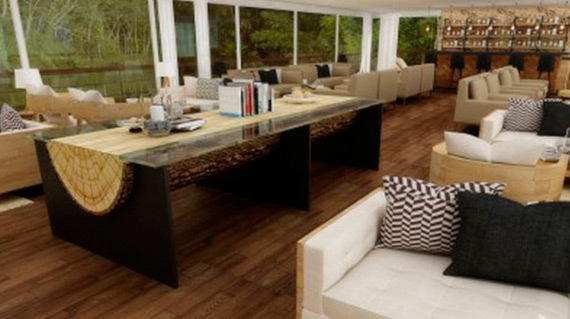 Briefing in the Indoor Lounge and recap of your itinerary and wildlife sightings at 7:00 pm. Return to the ZAFIRO at 11:00 am followed by an early lunch. Share a last lunch with your fellow passengers, before your onward journey. Disembarkation/Manatee Rescue Center/Transfer to the Airport. En route to Iquitos airport, you will visit the Manatee Rescue Center, where biologists and volunteers care for endangered Amazon manatees that conservation authorities have rescued. See how the manatees are cared for, and prepared for re- introduction into their natural habitat. Draft: 01.1 m / 3,61 ft.
Water Treatment System: Water Treatment Plant 1.00 m3 per hour. Safety: Radio communication system with separate battery, satellite phone, life jackets, flare signals, fire extinguishers and smoke detectors in each cabin, onboard defibrillator. Boats: Three auxiliary aluminum boats equipped with four-stroke, low emission engines (two engines each), constant radio communication with the ship, life jackets and flares. Two boats with capacity of 25 passengers each and one with capacity of 8 passengers. Crew: 20, including Cruise Director and 2 naturalist bilingual guides (english- spanish). Accommodation: Up to 40 passengers with private facilities. With the ability to accommodate a child in each cabin. Cabins: Suites (16): 21 m2 / 226.04 ft2. 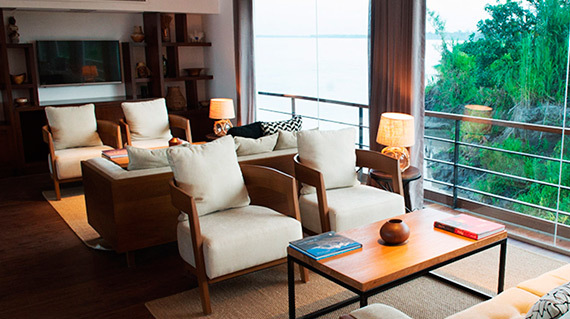 Panoramic view floor to ceiling windows with separate balcony overlooking the Amazon River. 4 interconnected suites ideally for families. 1 suite has disabled facilities. Master suites (4): 23 m2 / 247.57 ft2 with 90-degree front-facing windows All are air conditioned with en-suite bathroom and living room.